Tempur Sealy Commits Million Dollar Product Donation To Assist Victims Of Hurricane Harvey | Tempur Sealy International, Inc.
LEXINGTON, Ky., Aug. 30, 2017 /PRNewswire/ -- Tempur Sealy International, Inc. announced today that it is committing $1 million in bed donations to support the recovery efforts in southeast Texas in the wake of Hurricane Harvey. 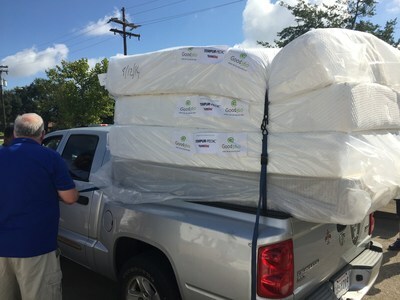 Tempur Sealy's commitment will provide mattresses to victims during the long rebuilding process after the devastation caused by the hurricane. Tempur Sealy will work with its long-time disaster recovery partner, Good360, which directly coordinates with local recovery agencies to meet the needs of families impacted by disasters. Thompson added that in addition to the million-dollar commitment of Tempur-Pedic and Sealy mattresses, the company will also be working with its valued retail partners in the region to provide additional community assistance in the coming months. Tempur Sealy and Good360 have been engaged in past disaster recovery efforts in Louisiana, North Carolina, South Carolina, West Virginia and others. The partnership has helped thousands of families begin to rebuild their lives following natural disasters. Good360's mission is to transform lives by providing hope, dignity, and a sense of renewed possibility to individuals, families, and communities impacted by disasters or other challenging life circumstances who, without us, would struggle to find that hope. As the global leader in product philanthropy and purposeful giving, we partner with socially responsible companies to source highly needed goods and distribute them through our network of diverse nonprofits that support people in need. Good360 has distributed more than $9 billion in donated goods around the world, helping its network of more than 57,000 prequalified nonprofits strengthen communities and improve the lives of millions. Good360 is proud to partner with corporate donors such as Walmart, UPS, CVS Health Foundation, Nike, IKEA, Sears, Home Depot, Tempur Sealy, Grainger, 3M, Mattel, Crayola, Gap, Inc., ANN INC., Williams-Sonoma, and Hilton. Good360 is a registered 501(c)(3) organization. Learn more at https://www.good360.org.